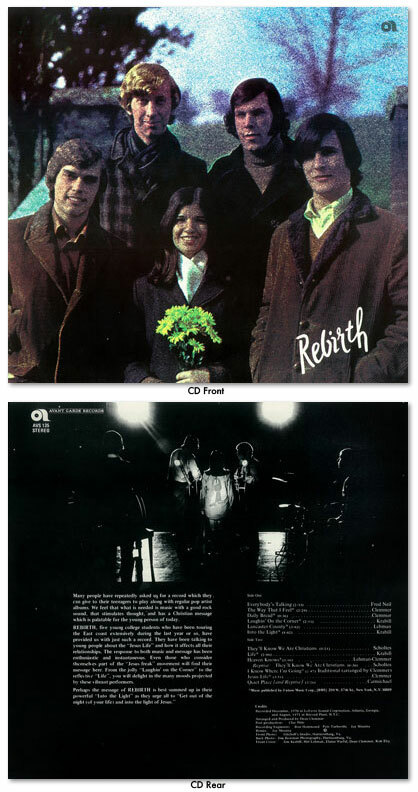 ​4 decades ago, 5 young Mennonites formed a band called "Rebirth" and rocked the Christian music world. Now, for the first time ever, Rebirth's 1971 self-titled album is available digitally. Order now on CD, iTunes, Amazon and Google Music. ​As unknown college troubadours in 1969, the band (Jim Krabill, Mel Lehman, Elaine Warfel, Dean Clemmer, and Rob Eby) would never have predicted the success to come. That success led to two national tours and several recordings. And the rest is history. ​As seniors at Eastern Mennonite College (now University), they peaked with a recording contract and an offer of a one-year touring contract from a national campus ministry. They graduated, took a VW bug and their music to state-of-the-art studios in Atlanta NYC and made their third and final recording. Their original songs and powerful arrangements of folk and Christian rock classics won them devoted fans still loving them today. But then the magic died as they all pursued separate careers.